Messaging on the go is one of the core tenants of the Simplifeye experience. This guide is meant to provide you an overview of how to best utilize all of our messaging features in the Simplifeye mobile and wearable apps. Along with instructions on using conversations and chat groups (separate from Flow assignment groups), you will also find guides on downloading attached files as well us muting conversations. Conversations are the primary means of text communication within Simplifeye; they operate similarly to group messaging in many other apps. 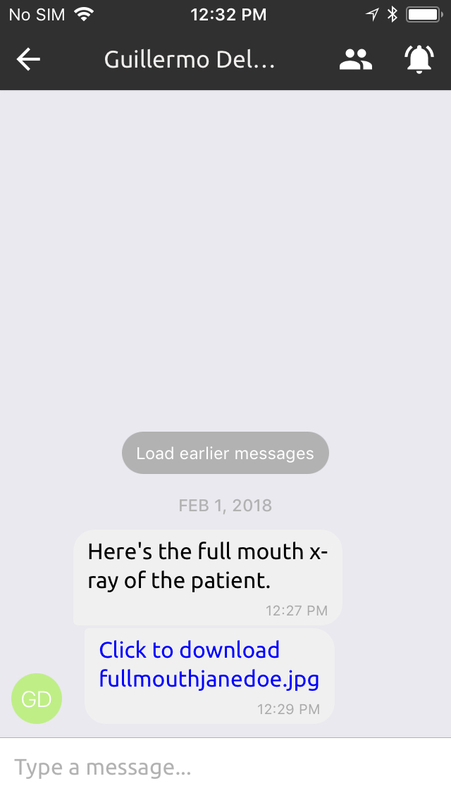 In the Messages tab, you will be able to view all messages sent and received by you. When creating a new conversation, you now have the option to send messages to chat groups that you are not currently a participant of. To see how conversations differ from chat groups, you may want to read our section on creating a chat group. Tap the green plus (+) icon on the lower-right section of the display. Once you've finished your selection, tap the green check mark to create the conversation. You can now send and receive messages from all participants. NOTE: Users cannot be added or removed from a conversation. If you need to add an additional user, you'll need to create an entirely conversation and include that user. Chat groups provide a private circle of messaging. Users within in a chat group can communicate amongst one other without any outsider users interfering. If an outside group views the group and attempts to send a message, an entirely new conversation will appear. No outside user will be able to access chat group communication unless they are added to the chat group. Chat groups allow you to send easily messages to multiple users at once. To send messages to all users within the group, a user can add the chat group as a participant when creating a new conversation. As above, no outside user will be able to access chat group communication unless they are added to the chat group. Click the green plus (+) icon on the lower-right section of the display. 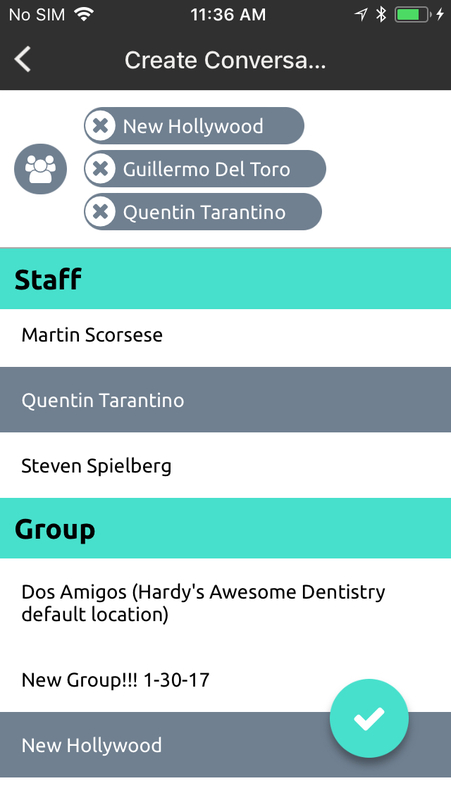 Enter the name you want to give the group and tap "Return"
Highlight the staff users you'd like to include in the group. Once you've finished your selection, tap the green check mark to create the group. Once a group is created, any user in the group can add new users by following these steps. Note that any new users will be able to view the group's entire chat history. On the messages tab, find and select the group that for which you would like to edit the participants. Tap on the users icon on the top-right of the display pull up the current list of group chat participants. Select the users you would like to add as participants to the group. When finished with your selection, tap on the green check mark to confirm. The participants list will then be updated with your latest additions. Users can remove users from a group just as easily as they can add them. Again, any user in the group can remove a participant. Once the participant is removed, they will no longer have the ability to view the group chat. In the Conversations view, find and select the group that for which you would like to edit the participants. 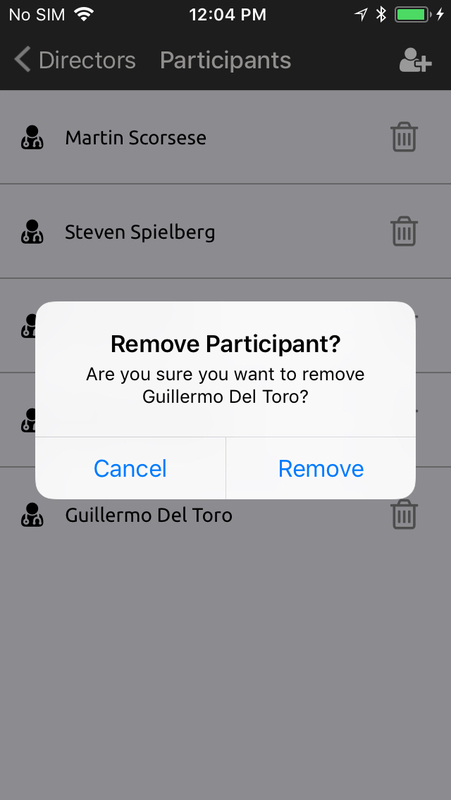 Locate the participant you'd like to remove from the group and tap the trash can icon to remove the user. Your patient list will then be updated with your latest removal. NOTE: If you yourself are removed from a group, you will immediately be removed from the chat and will no longer have access unless you're added as a participant again. If another user sends you a file using the Simplifeye dashboard, you can now download the file to your mobile device; it's as simple as the tapping the link! When a user sends a file in a group chat or conversation, just tap on the link to open the file. Depending on the file, you'll have numerous options on what you can do with it. Among other things, this means downloading the file, viewing it on your device or sharing it. If you're out of the office or in a meeting and don't want to be disturbed, simply mute any and all conversations in the Simplifeye app. To mute all messaging notifications in the Simplifeye app, tap the bell icon at the top of the Messages tab. To mute specific group chats and conversations, just open the messaging thread and tap the bell icon to the right of the title. The title bar color will then change from black to red. These individual conversations will have a red icon in the Conversations view as shown in the images below.